Lots going on lately. I’m on vacation and half of my family has been here from Tampa and Seattle. It was too soon to take the RETROvan camping with us at Trillium Lake, but my scramble to make things presentable was rewarded by the arrival of twelve dinette/berth cushions from a shop in Minnesota. The custom movie clapboard headrests turned out amazing, and the rest of the cushions look great. But I can’t Velcro them into place until I finish painting the base cabinets and attach the aluminum wall panels. There is, however, a problem: I had specified exact dimensions for each piece, not accounting for the ‘crowning’ effect of the premium filling. So each cushion came out a half inch too big, and no one at CushionSource.com warned me about this. Even a half inch per cushion adds up to two inches across the entire span. So now I have to fit 75 inches of material into a 73-inch span when reconfiguring from dinette to berth. It’s not terrible, but it does make it very difficult to squeeze the backrests onto the middle table top to form the queen bed. You really have to wrestle them in place and that’s disappointing. Once again, you make extra efforts to plan things out and then you inevitably get back something that’s out of spec. It has happened several times during this project, when outsourcing was required. Maybe in this case the cushions will get squishier over time? They’re pretty firm now, which is good for sitting and sleeping. But overall, I’m satisfied with the results. Especially considering how the engine rebuild went. And when the windows arrive I’ll have much bigger fish to fry. My son was here for a couple days, and he’s a Manufacturing Engineering major. 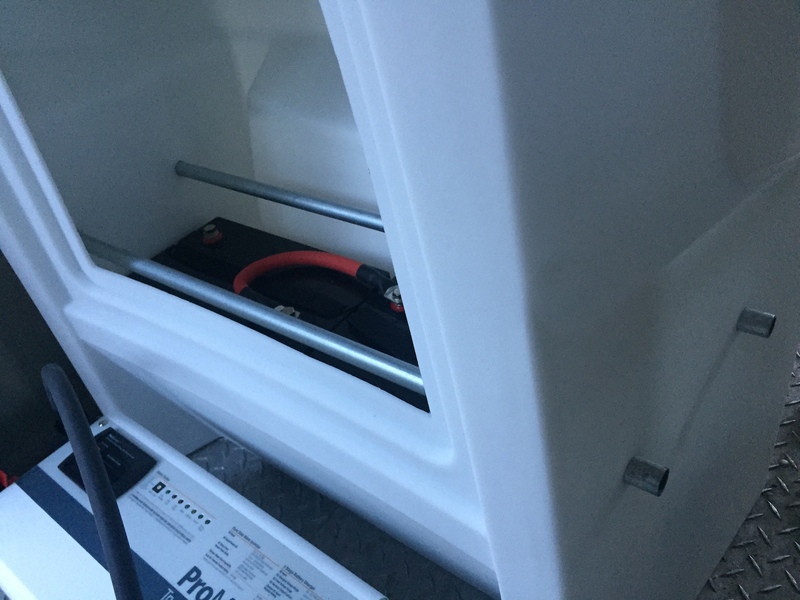 We bolted the main pedestal in place and my daughter helped me jig-saw the 24×48″ table corners round, using the same 3″ radius as the window corners. Those are the subtle design consistencies you don’t really want anyone to notice. It’ll just all feel right, because our brains are wired to subconsciously detect patterns. And of course this task involved yet another trip to Home Depot because my 3/8″ bolts were a half inch too short underdecks, where 56 years of rust flaked off into my eyes. 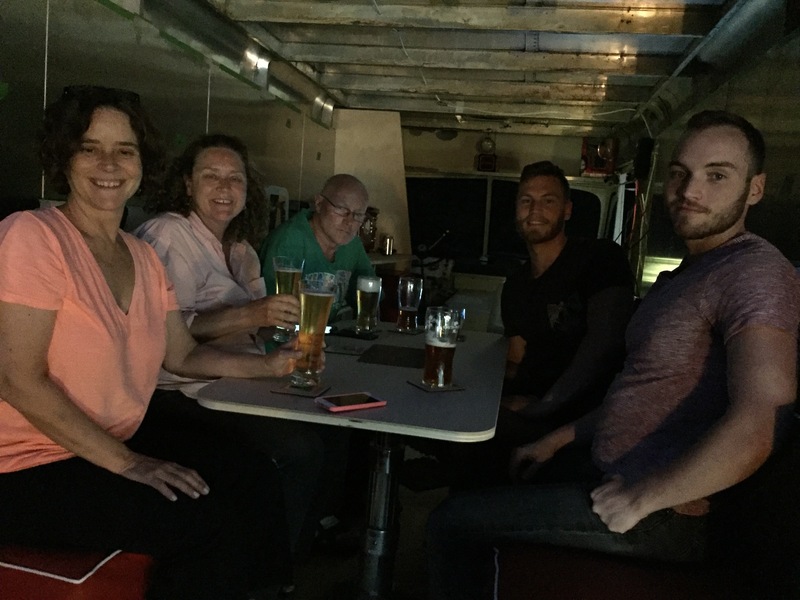 But we got it done, and then tried things out for Happy Hour and had a great time seating six in the booth, comfortably. I was relieved to not have to cut an asymmetrical notch in the table top. We all just agreed it would be ‘skinnies’ on the right, ‘fatties’ on the left. But ergonomically speaking, almost anyone can get their legs between the galley cabinet and the table top while in the act of sitting or getting up. As long as they don’t put too much weight on the edge of the table top, of course. The retro laminate will go on later. Meanwhile, I received my first batch of custom AC/DC panel labels and put a few on the helm. The verbiage was very carefully thought out, of course. I’ll post pictures later when that’s all settled. I also found some cool iPad apps to simulate activity on the helm. Apps like sound meters, music visualizers and LCARS displays from Star Trek: The Next Generation fame. My son also mounted Photon Torpedo Tube #1 above the driver’s seat. 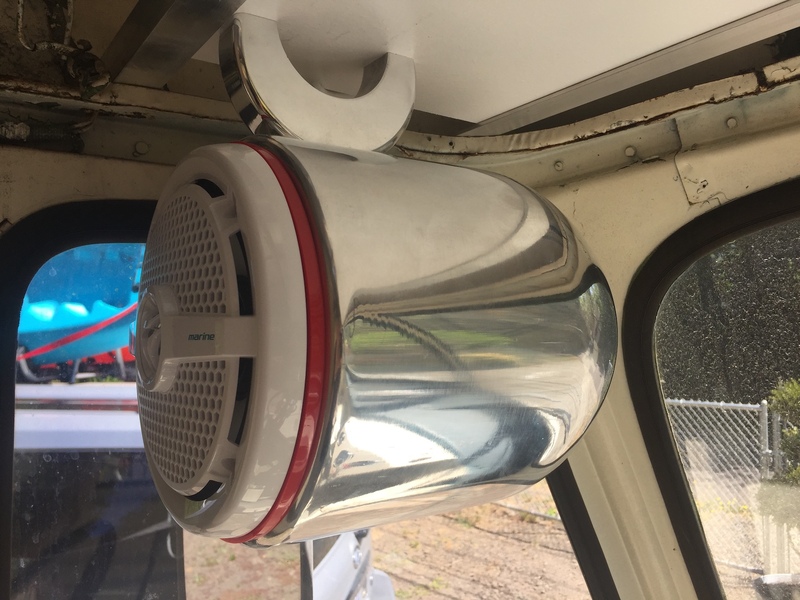 This custom speaker can looks amazing from inside and outside the RETROvan, and I couldn’t wait to hear it in action. So today, I ran a 12V circuit up above the cockpit and wired up my Pioneer AppRadio 4. Then I pre-wired a second Sony 2-Way Marine Speaker, which is not mounted in a can yet. It’s just resting on the overhead shelf. I had been using a Bluetooth speaker, set on that shelf. But these two speakers really up the ante, and I don’t have to recharge them of course. You can actually enjoy music over the whir of the ventilation fans now. And I’m digging that, sprawled out on the berth as I type this post. Normally the receiver would be wired to the parking brake, the reverse shifter, and the accessory switch on the ignition key. 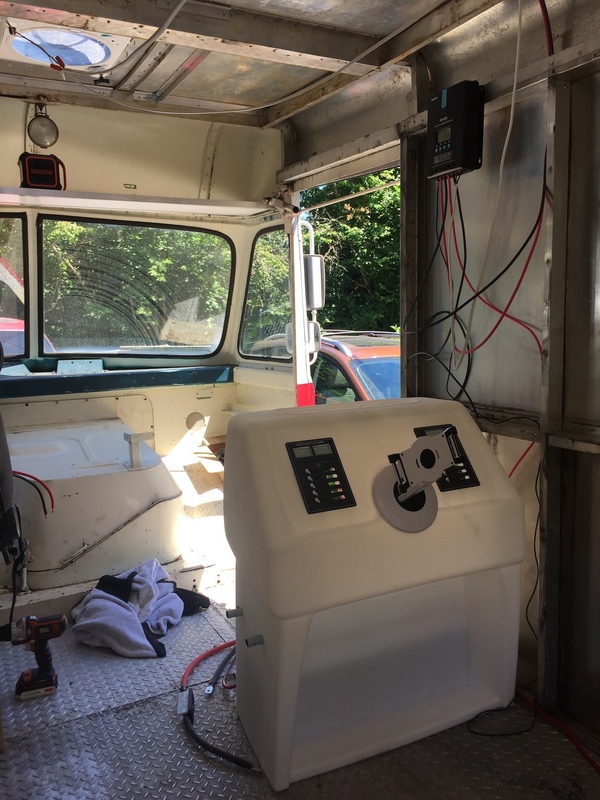 But for the RETROvan, I’ve hard-wired it directly to the helm’s DC panel so that it can always be turned on, fed by solar and/or shore power. That involves a special jumper that bypasses the annoying feature that kills all the fun stuff while your vehicle is in motion. I can always turn it on or off via the DC circuit breaker. Later I’ll have to figure out how to enable the backup camera, maybe with a manual toggle switch to simulate putting the RETROvan in reverse. So today, my DC ampere load went from 0.5 for just an iPad and an LED display, to a whopping 1.0 amps including the receiver and two speakers. I’ll wire up the other two rear speakers soon, but I have to fabricate three more cans using my custom plastic mounting adapter rings — and that will take a lot of time drilling holes with delicacy. Oh, one major problem: When the RETROvan’s back doors are closed, I don’t get any WiFi from the house. 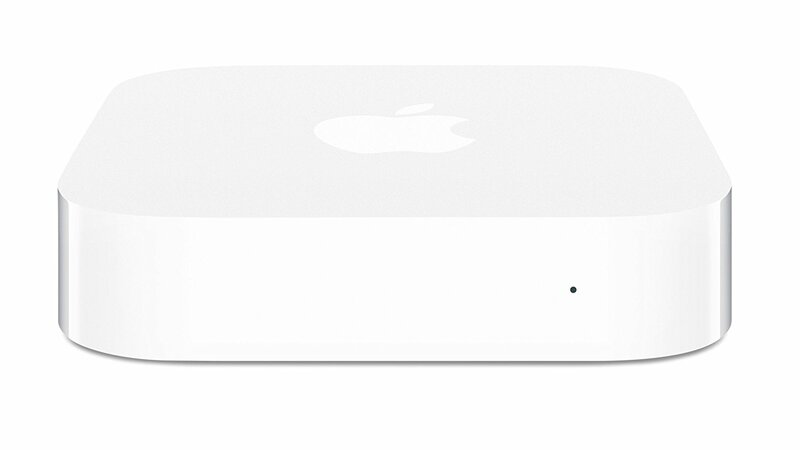 That might change when the back windows go in, but I did go ahead and order another Apple AirPort Express to extend my network right at the garage. If that doesn’t work, then I’ll have to go with a non-Apple antenna made for RVs. Those work like an extender inside the RV with the antenna mounted on the outside. 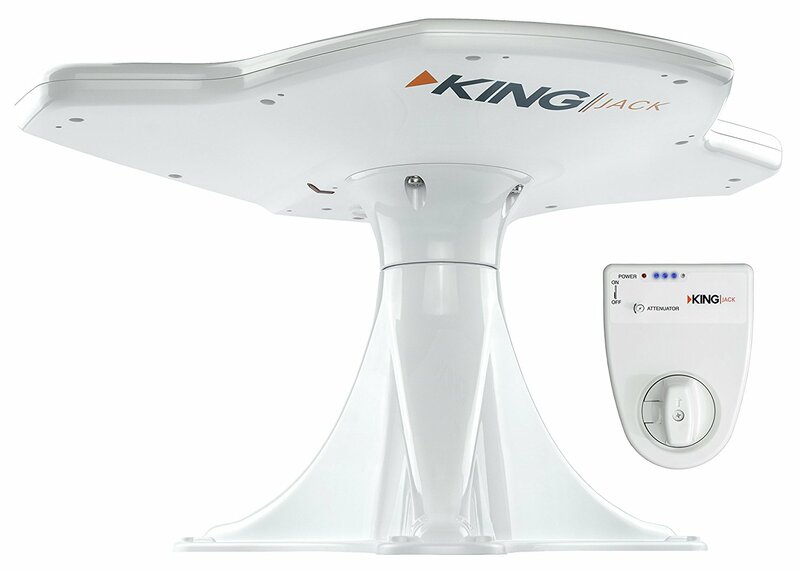 I also got a cool, white, bat wing-shaped HDTV antenna made by King, to mount on the roof and pull in all the local TV channels for free. I slept in the RETROvan until 5:38 AM, when it just got too cold. That motivates me to finish wiring up the AC circuits so I can plug in that cool space heater/fireplace. 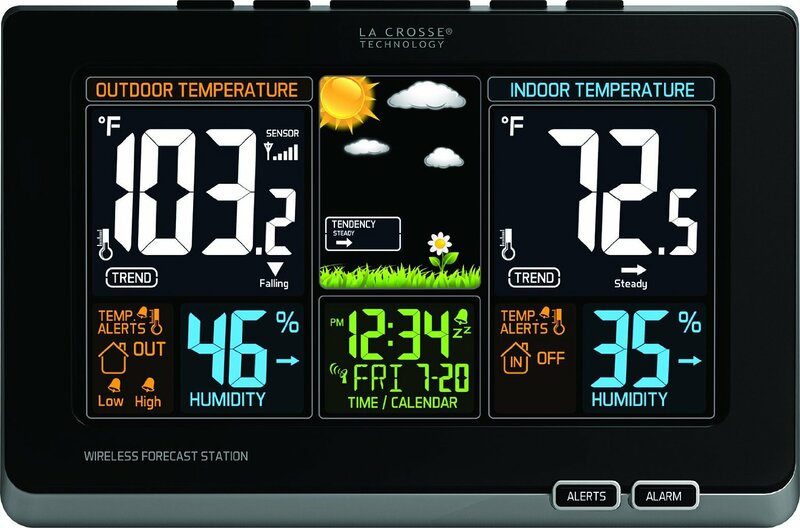 I also ordered one of these weather station displays, which may mount on the center of the helm. I love colorful infographics! Oh, and one last thing: I found a nice collection of Star Trek background audio loops for some retro high-tech ambiance, which makes the RETROvan feel even more like a movie set. I’ll probably have to trim these a bit, especially around the various cockpit obstructions. And then waterproof any gaps. Remember, the three cabinet bases I already built have built-in floor sections, which means they’re modular and easily removed or replaced. These floor sections will give me a level surface throughout, providing important stability by distributing the loads under the two seat pedestals and the table/berth pedestal. The RETROvan’s deck itself is simply a 1/8″ or maybe 3/16″ layer of diamond plate steel. 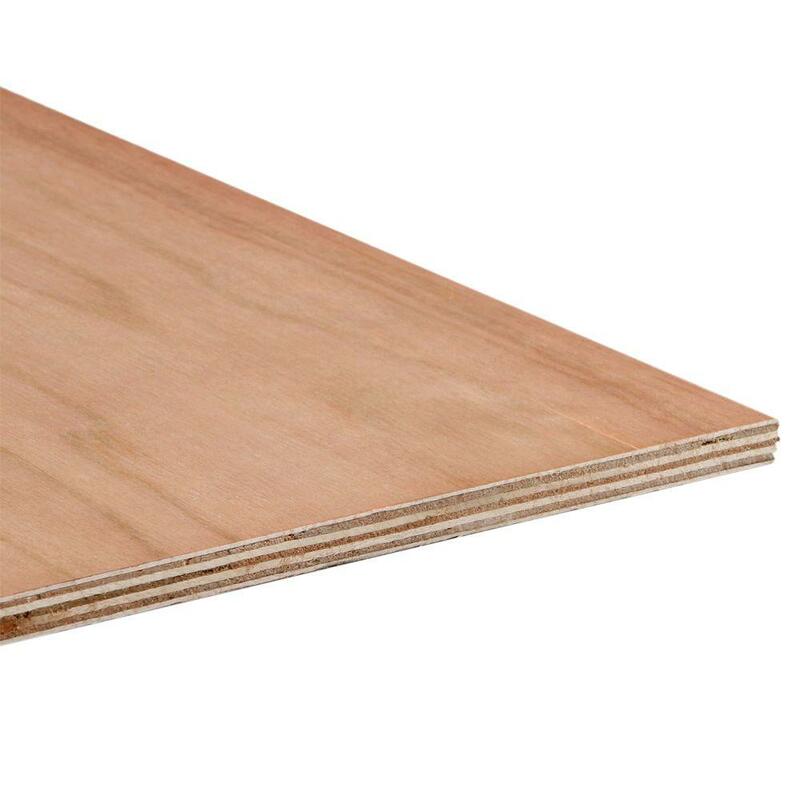 It’s adequately strong, but pretty flexy when you walk across it. Once positioned, I’ll screw the plywood down and cut out an access panel for the starter battery in the cockpit section. 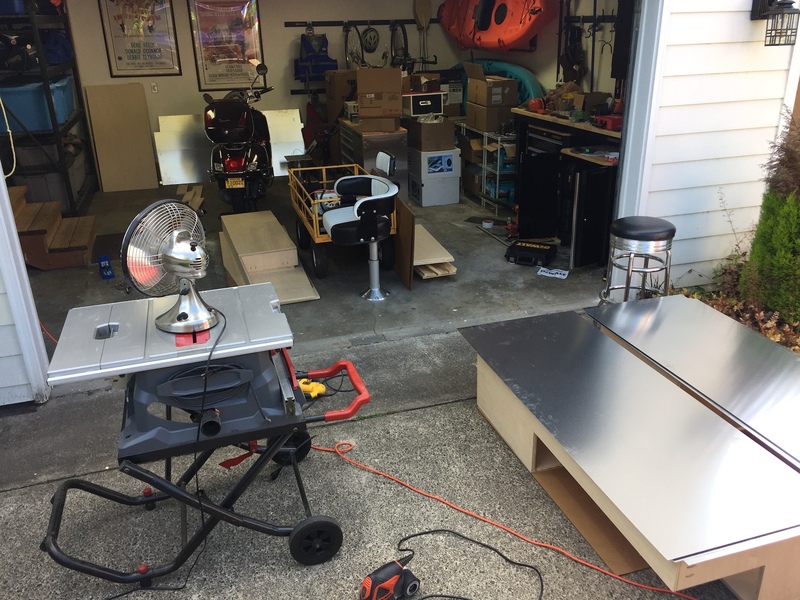 The next step will be to drill 5/16″ holes through the plywood and steel to bolt down the pedestals and helm. I’ve got the hardware in hand, including some 1-1/2″ fender washers for underneath. And hopefully that’s enough to minimize any wobbliness. If not, then it’s time to add some steel plates belowdecks. 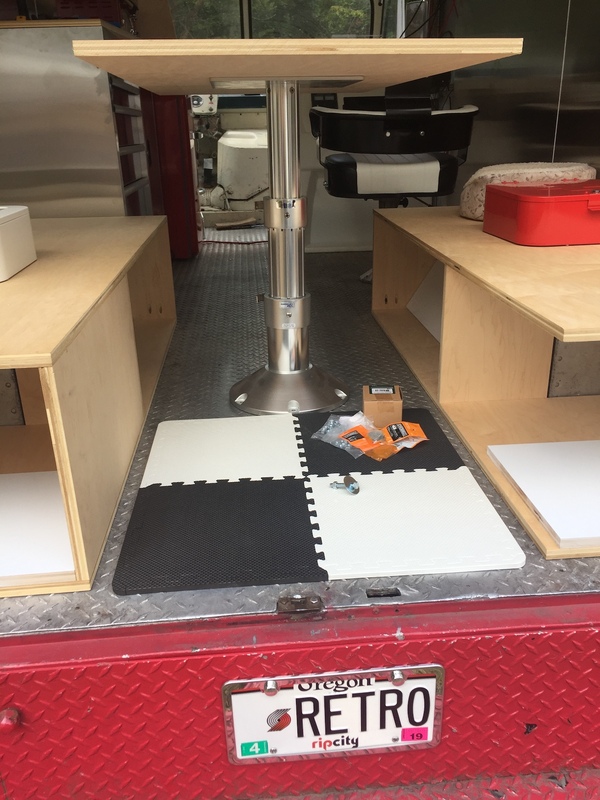 Fortunately for the table/berth pedestal, there is already a steel spine running down the center of the RETROvan. The rubberized black & white ‘puzzle’ tiles will go down later, maybe even at a 45° angle. Today seemed like a good day to clean up the driveway and reposition the RETROvan over to the side so that Olivia has more room to park her new Escape. But of course the starter battery was dead again, so I had to jump it with my little BoltPower kit. The engine finally kicked over and I moved the rig to the end of the driveway and put the parking brake back on. I left the engine running hoping to exercise it a bit and recharge the battery. I then spent the next half hour blowing and sweeping the driveway under where the RETROvan was parked. So far, so good. My first concern was that the oil catch pan we used while removing and re-installing the engine had a lot of fluid in it, and it was mostly red which means either blood or transmission fluid. I finally got the driveway clean and disposed of the bodily fluids properly. The next thing I know, I hear the RETROvan’s engine stop so I look up and think, “Weird, did it run out of gas or what?” But then to my horror, the van starts rolling back down the driveway towards me! So I dropped everything and sprinted to the open door, dove over the open battery compartment hatch and grabbed the brake pedal with all my might. The RETROvan eased to a stop but not after bumping a concrete planter and moving it a few inches. Nothing major, but if I had not been there it would have slammed right into the corner of the garage. Or worse, it could have run over Mazy or caused me to spill a beer. Here’s my security camera video of the Rollback. It’s quite heroic. So now, of course, the engine won’t start again because the battery is worn out. I jump-started it again and managed to get the rig into the position I wanted and secured the rear wheels with chocks. But clearly the parking brake is not doing anything. It’s relying on the transmission to keep the RETROvan from rolling, and that’s just not safe. Worse, I discovered that everywhere the rig had come to a rest, there was a fresh puddle of transmission fluid on the concrete. So I broke out a bag of cat litter to soak those puddles up. Meanwhile, I ordered a new Duracell Ultra group 29NF starter battery (not to be confused with the house batteries in the helm) from Batteries Plus. And guess what? Yep, that’s a very non-standard battery made for old fleet trucks, and nobody stocks it locally. So Tuesday’s the day for a fresh battery and another visit from Brett. On Tuesday, Brett came back to button things up in the engine compartment. He replaced the carburetor gasket that we couldn’t find before, he installed the PerTronix 1261 electronic ignition kit, he chased down some leaking oil and transmission fluid, and he fixed the exhaust manifold to lock its damper in the open position full-time, since we don’t have the spring and can’t find one online. Brett said everything’s done and she’s good to go — finally! Up on the left is the AC panel, and on the right is the DC panel. The Inverter is the big white metal box. Directly above it is a 200A fuse on the red positive cables. Below the fuse is the USB socket with two ports. Below the inverter (not pictured) is the battery bay. The AC Panel has a main breaker that turns the other three AC branch circuits on and off, and each circuit also has its own breaker. So far, the only circuit used is an extension cord to power my refrigerator. The second circuit will feed the galley’s AC outlets, for plugging in the toaster oven, microwave oven, coffee maker, waffle maker, etc. The third circuit is reserved for either the HDTV or future air conditioner. Meanwhile, the DC panel is only using two circuits so far. 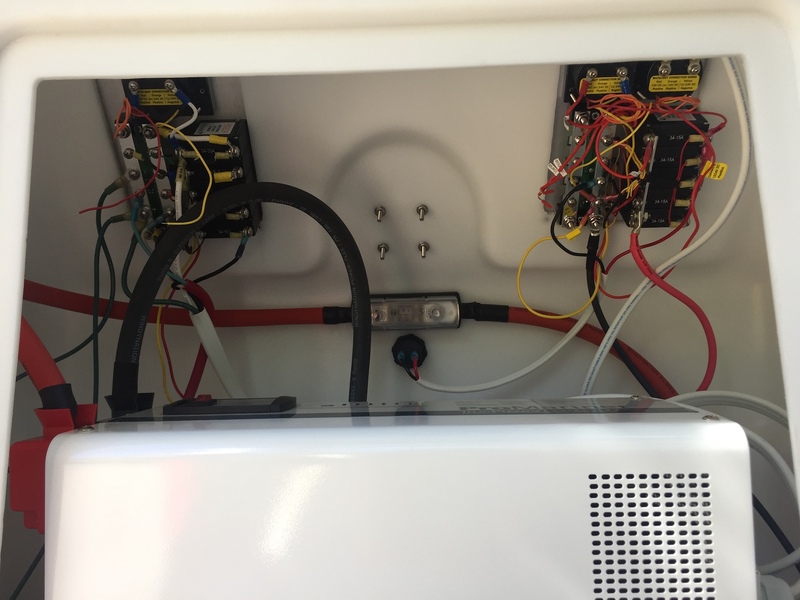 The top circuit is for the instrument panel backlighting, and I haven’t connected the AC’s red and yellow backlight wires to the DC panel yet. The second circuit is for the USB socket and eventually other DC sockets (12V and USB) throughout the cabin. The third circuit will be for the overhead lights, the fourth for the AppRadio and stereo system, and the fifth will be for the galley’s water pump. By far the most frustrating part of wiring such a compact electrical cabinet was gravity. I dropped small screws down into the battery bay no less than four times, and had to fish them out with a variety of magnetic and sticky picker-uppers all while dripping sweat and dodging live wires. 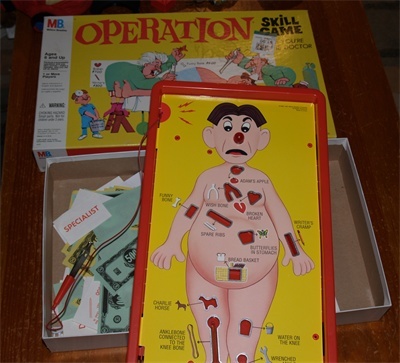 This reminded me of that classic game Operation, because with the slightest jiggle or bump I wound up dropping the screw again. I eventually learned to spend extra time lining my work area with rubber sheets (much like the Oval Office). And even then a loose screw would still bounce or roll off and drop into the chasm. 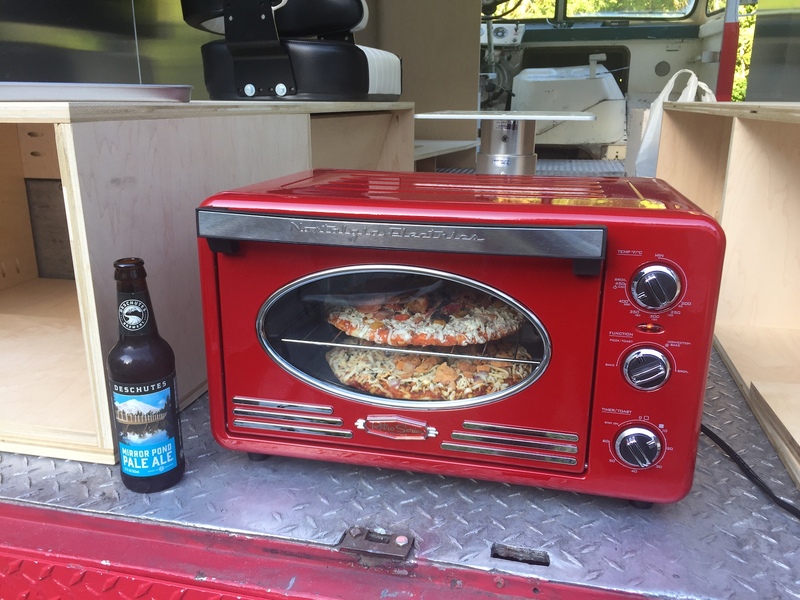 When I finally connected the extension cord to the outside of the RETROvan, I was rewarded with a KA-CHUNK sound from the inverter’s transfer switch. And in that moment, I felt like Doc from Back to the Future. The RETROvan finally has enough power to keep the most precious cargo cold. Soon I’ll post a shot of the helm all lit up at night. But right now it’s Beer:30. 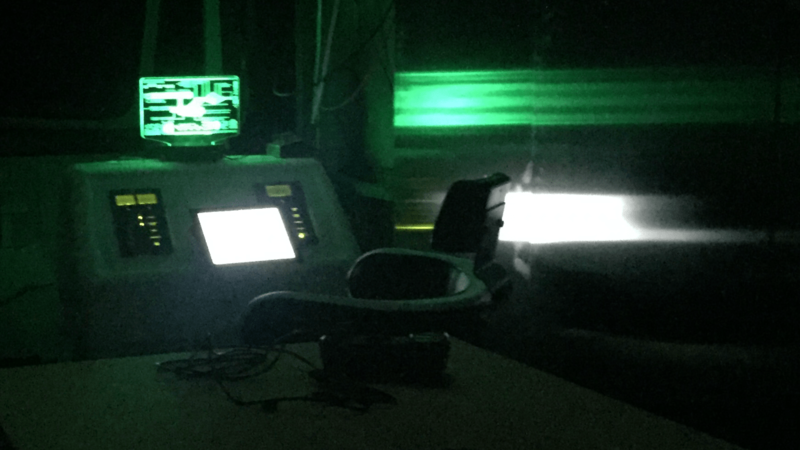 Looks like we’ve just engaged the warp drive, doesn’t it? Now that summer is in full swing, I was extra motivated to do some electrical work and get my ventilation system going. No more sweating like a pig at a bacon festival. I’ve got the batteries in the helm, and they’re connected up to the Renogy Rover 40A MPPT solar charger/controller. The Rover is the black box that I temporarily mounted above the helm on the right. That’s connected to the four 100W panels on the roof with 8 AWG cable. Then the two FanTastic Vents are connected directly to the 12V load terminals on the Rover. 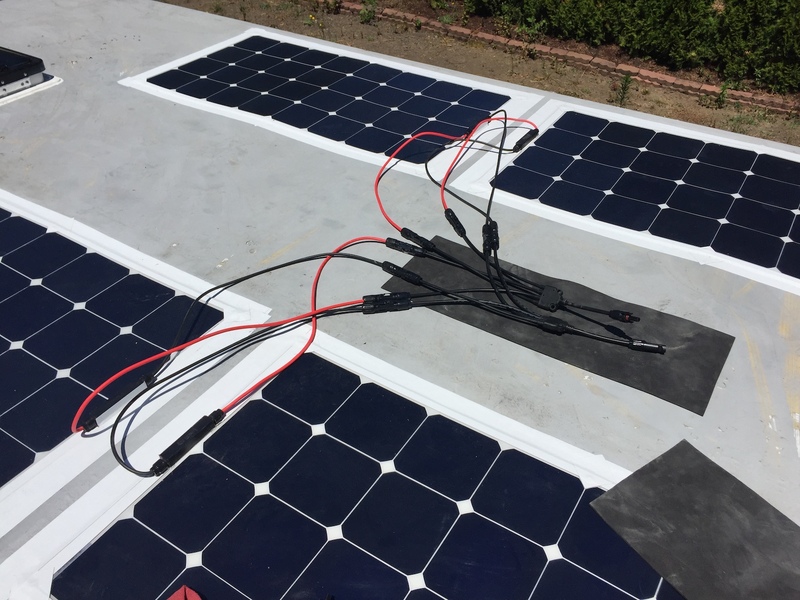 And that makes a self-sufficient off-the-grid system, using solar energy to charge the batteries and the batteries to run the fans. The fans are super smart, too. They have thermostats and rain sensors that can open and close their domes automatically. So as soon as the sun heats things up to 72°, the fans kick on. As it gets warmer in the afternoon, the fans speed up. And some time after sunset when things cools down, the fans slow down and turn off. And if it should rain, the fans will turn off and the domes will close by themselves. Pretty sweet, eh? And yes, they work manually too. I drilled four 3/4″ holes in the sides and inserted two pieces of 1/2″ EMT conduit. I later ‘capped’ the ends of the pipes on the outside to keep them from slipping out of their holes, as they did repeatedly when I tried to wrangle the 45-pound inverter through that hole. And here’s the result. 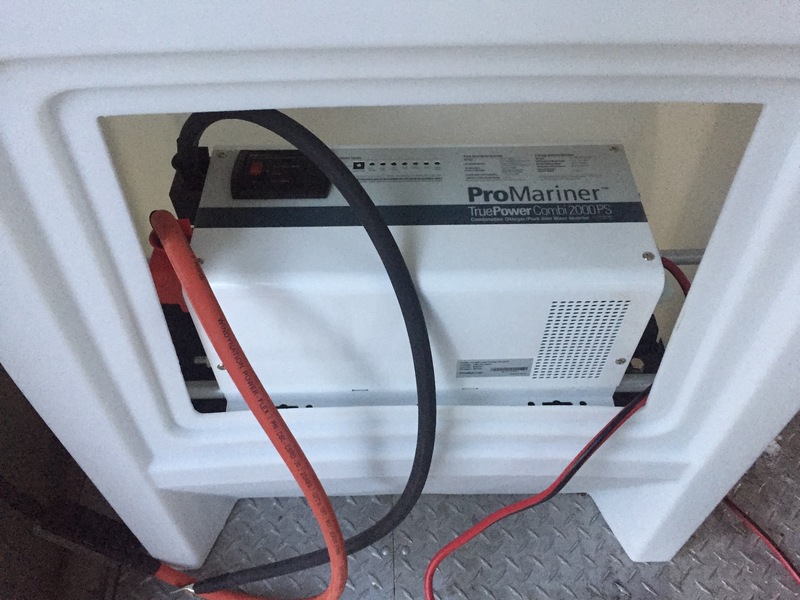 The inverter is straddling the pipes about two inches above the batteries. 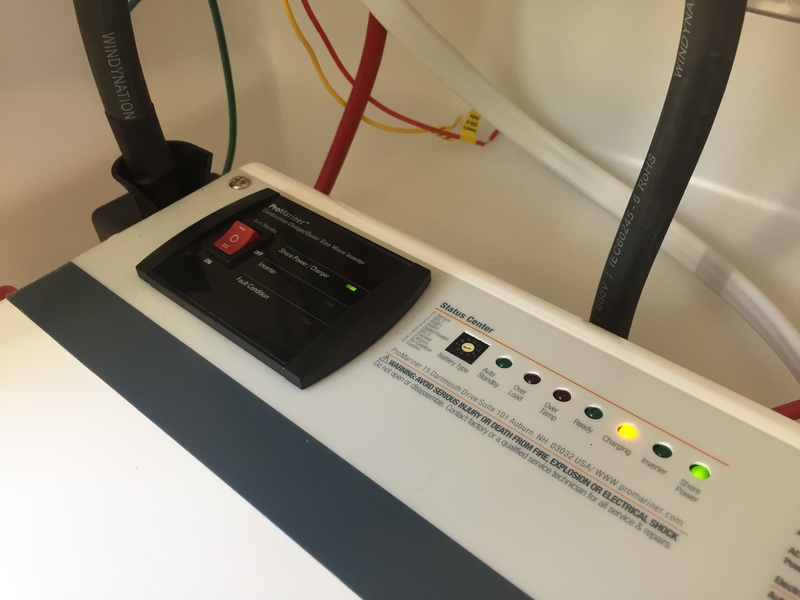 The inverter can slide left or right depending on which end I need to access. I’ll also try to remember to put a strap around it before I drive off anywhere. Now normally you’re not supposed to put electronics inside a battery compartment. But remember, these are sealed AGM batteries, not flooded lead-acid. So they should emit no combustible gasses. And just to be sure, I will be cutting plenty of ventilation holes in the helm and installing a fan if necessary. It probably won’t be necessary because the inverter has a fan on one end already. The helm’s hatch hole seems to provide ample access to the backs of the AC/DC panels. I won’t be using the hatch cover that came with the helm itself. I’ll be having one made custom at TAP Plastics later. And yes, it will be cool because it’ll be the first thing you see when you step up into the RETROvan. One nice thing about my floorplan is that when working inside the helm, I can just sit on the steps and everything’s at eye level. It’s also nice that none of these powerful electronics take up any valuable cabinet or storage space. I also installed a Blue Sea Systems USB port to power the helm’s iPad mount. And there’s now a Blue Sea Systems 200 Amp ANL fuse block mounted just above the inverter, on the inside. Now comes the hardest part: Wiring up the AC/DC panels. For this I got 100 feet of Ancor 12/3 marine grade cabling for AC, and 100 feet of 12/2 to go along with the 100 feet of 16/2 I had already bought for speakers. 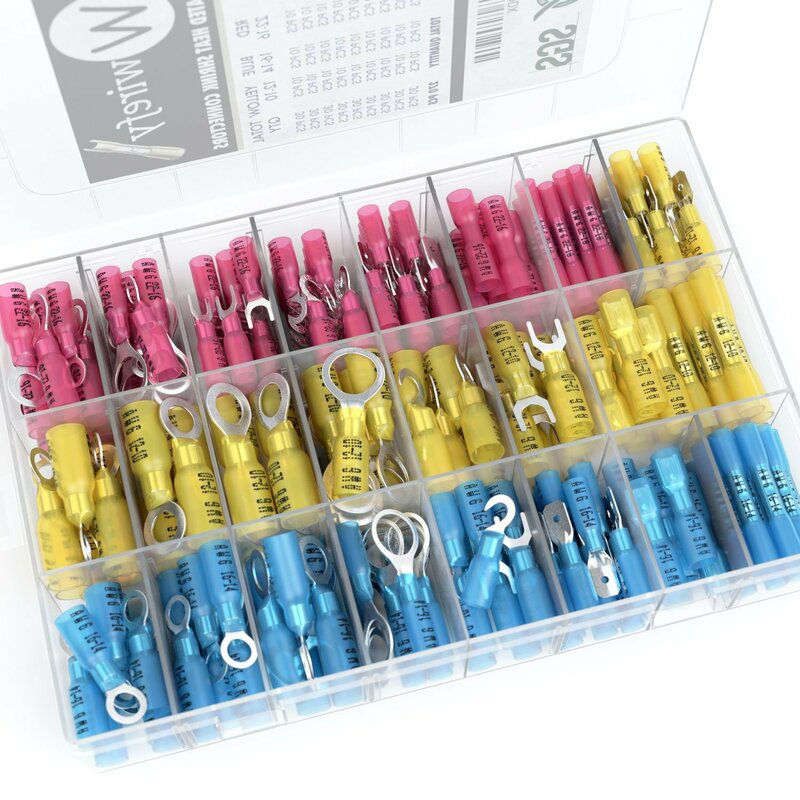 I’ll have to make all my own terminal connections, so I ordered a Wirefy kit with hundreds of assorted heat shrink connectors. Now if I could only follow the wiring diagrams for the panels, while still incorporating the inverter. The diagrams seem to omit important information, like what size main fuse to use. I might start with the DC side because it’s a little safer. But I have done plenty of AC work inside our house. 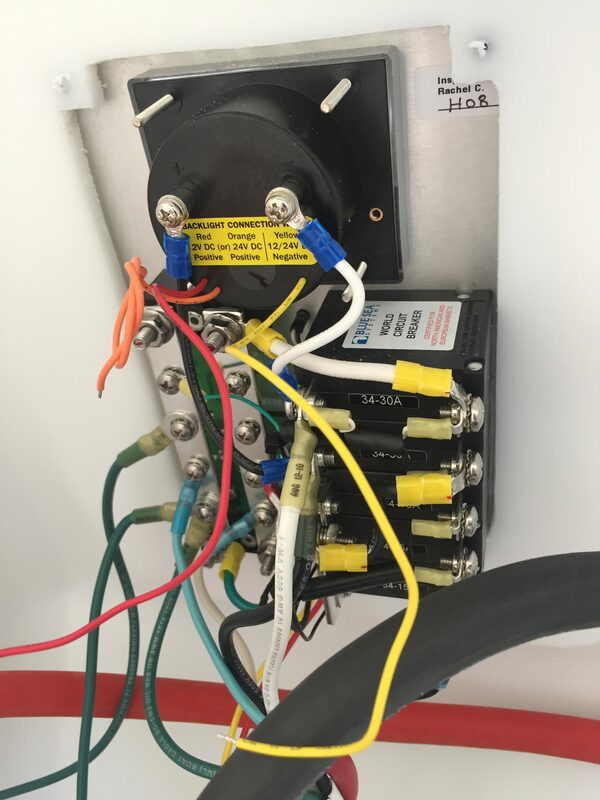 The one thing I’m sure of in the RETROvan, is that the Marinco 120V Shore Power Inlet will connect directly to the dual-pole main circuit breaker on the AC panel first. And from there to the AC input side of the inverter. But the fun place to start would be the backlit analog gauges. Because then I can see things coming to life as each circuit is connected. Oh, I almost forgot. Those massive red and black cables pictured above are 2/0 AWG. I bought them pre-terminated in three sets, made by WindyNation. 1-foot, 2-foot and 3-foot. I used a red 1-footer as the jumper between my two 6V batteries. I used a red 3-footer from battery + to the 200A fuse block, and then a red 2-footer from the fuse block to the inverter +. The negative side is simply a black 3-footer from the battery – to the inverter –. So that means two black cables go unused, but that was a lot less stress than trying to cut and terminate my own battery cables which are 70mm in diameter and stiff as hell. But in the end, they all seem to fit inside the helm without kinking or tying in knots, much like your lower intestines. The trick was to dry fit everything before connecting anything. There was one moment of terror when I disconnected the 8 AWG battery cables from the Rover but forgot to disconnect them first from the batteries, and then they both touched the bare diamond plate floor. 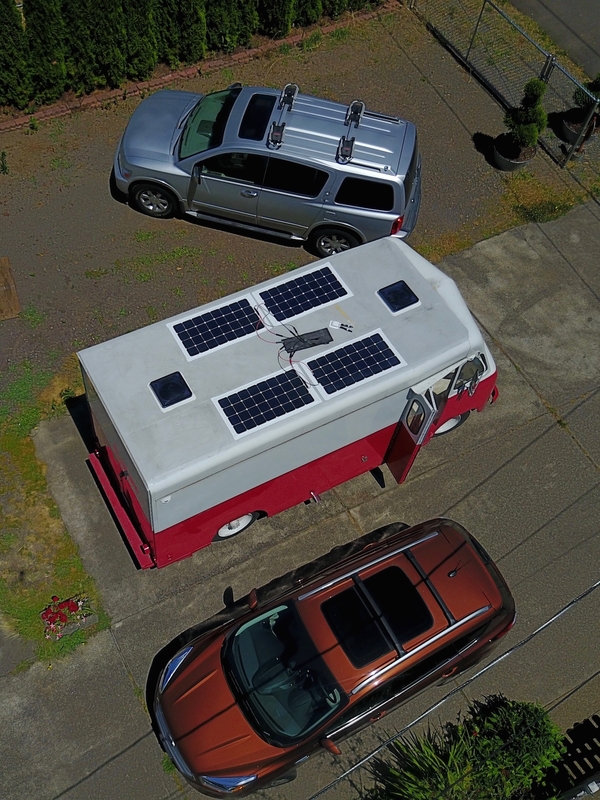 Today’s the day the RETROvan became ready for its first test flight, and just in the nick of time for Independence Day. And then there’s the 6 quarts of special “old school” (high sulfur) engine oil that was supplied by Portland Engine Rebuilders. These are all parts I intend to stock up on for the inevitable breakdown. Nervous or otherwise. Shortly after my third trip to an auto parts store in one afternoon, just to find one last 1/8″ pipe plug, the engine coughed and sputtered and then roared to life. With a few tweaks Brett got it to settle down to a steady purr. And then the entire back of the van started rumbling with harmonics, probably because it had been gutted. It reminded me of a hound dog shaking off in your face after a swim. After Brett Gorilla Taped the limp accelerator pedal back to its linkage, I bolted the ugly driver seat back on and broke moor. Video of the RETROvan’s First Flight! The drive up and down the street was exhilarating, like when a long lost friend awakes from a coma. Or as my wife likes to say, like stripping off your clothes and diving into a volcano. Or as our cat Mazy might think, like a 3rd of July parade that nobody knows about. I later realized I had forgotten to release the parking brake the whole time.